When NATO forces intervened in Libya last year to help oust Muammar Qaddafi, military planners were aware that one of the greatest battles of the conflict would not be military, but ideological: justifying the legitimacy of their actions to both Libyans and the wider international audience. For international audiences, this meant conveying NATO’s commitment, legitimacy and resolve and being prepared to counter criticisms of its military policies. 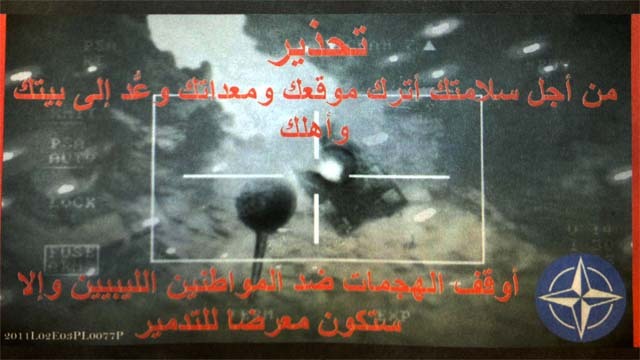 An example of a psychological operations leaflet dropped over Libya by NATO forces during Operation Unified Protector. For audiences within Libya, strategic communications involved the production of media to influence Qaddafi loyalists to leave their weapons and cease killing civilians. Today’s information environment, characterized by a 24/7 news cycle, the rise of social networking sites, and the interconnectedness of audiences in and beyond NATO nations territory, directly affects how NATO actions are perceived by key audiences. That perception is always relevant to, and can have a direct effect on the success of NATO operations and policies. NATO must use various channels, including the traditional media, internet-based media and public engagement, to build awareness, understanding, and support for its decisions and operations. 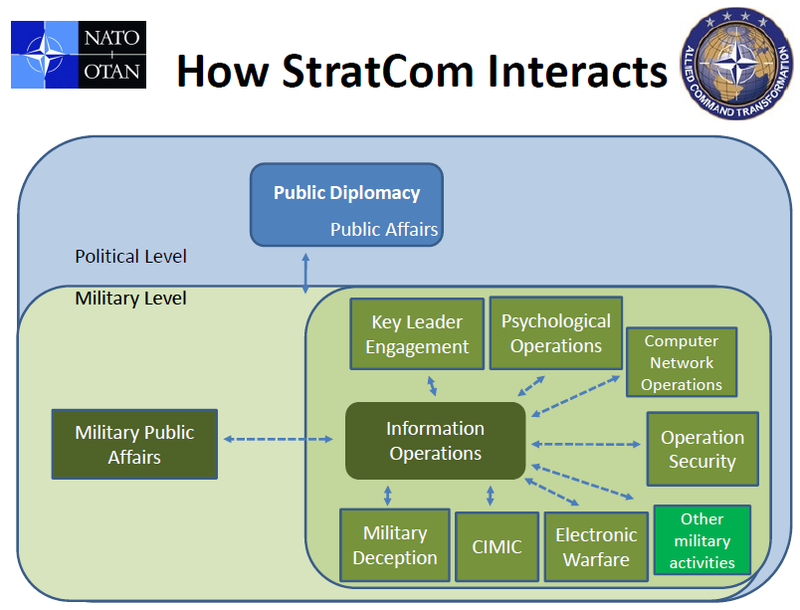 A diagram depicting the relationships between various components of NATO’s strategic communications efforts. At the military level, strategic communications encompasses everything from psychological operations to electronic warfare. Deception operations, computer network operations and even engagement with local leaders all fall under the category of information operations, one of the broadest areas of strategic communications. PSYOPS have been used throughout history to influence attitudes and behaviours of people, leaders and key communicators. The dense and ubiquitous nature of today’s global information environment, coupled with NATO’s involvement in non-Article 5 Crisis Response Operations, have dramatically increased the demand and importance of effective PSYOPS. In today’s Information Age, NATO can expect to operate for an extended period of time in an area where sophisticated, indigenous media compete for influence over the perceptions of local audiences. The organisation, state, or entity more able to effectively influence the understanding of a crisis or conflict, especially managing the perceptions of particular target audiences, will likely be the most successful. PSYOPS are conducted to convey selected information and indicators to governments, organisations, groups and individuals, with the aim of influencing their emotions, attitudes, motives, perceptions, reasoning and ultimately their behaviour and decisions. Based on their understanding of the different perspectives and biases of the different audiences, StratCom should develop an over-arching, resonating narrative, upon which themes and master messages can be based. StratCom must then refine the themes and master messages depending on the strategic conditions, taking into account target audience receptiveness, susceptibility and vulnerability to different historical, social, cultural, and religious references. Examining NATO’s strategic communications frameworks for several recent conflicts provides concrete examples of the organization’s efforts to construct and maintain narratives favorable to their military and political objectives. The frameworks, which are signed by NATO’s Secretary General and sent to diplomatic representatives of allied countries involved in the conflict, detail a core message and various supportive themes designed to promote the narrative advanced by NATO. For example, the 2011strategic communications framework for Afghanistan emphasizes the themes of resolve and momentum to “maintain Afghan and international support for the continuation of the mission.” The strategic communications framework for NATO’s intervention in Libya emphasizes legitimacy, that NATO is “operating under a clear international legal mandate, in coordination with the Contact Group on Libya, and with broad regional support”, while managing expectations and emphasizing the humanitarian assistance being provided. Spokespeople play a central role in implementing the strategic communications framework by reinforcing the narratives decided on by NATO officials and countering misinformation. A training presentation for instructing NATO spokespeople in Afghanistan describes how to “control your media environment” by advancing “commercial” messages that support the strategic communications objectives for the conflict. The presentation lists cosmetic issues for spokespeople, like posture and controlling hand gestures, and even provides bridging phrases such as “First let me say . . .” or “The key issue here is . . .” to bring interviewers back to the spokesperson’s commercial messages. NATO has even worked to develop a framework for assessing the efficacy of activities to influence populations. Over a three year period from 2007-2010, NATO convened multiple research groups with members from the U.S., U.K., Belgium, Netherlands, Sweden, Canada and Germany to formalize a program for measuring the effectiveness of strategic communications activities designed to influence targeted audiences. The report seeks to develop a methodology for monitoring media, conducting surveys and determining the effectiveness of influence operations by tracking specific and quantifiable “impact indicators”. These indicators help determine whether the intended effect is occurring and provide feedback for future operations planning. Studying and implementing strategic communications has now become an essential component of NATO’s military operations as both a means of influencing populations in theater and abroad. As the development of doctrine for manipulating perceptions continues to become more sophisticated, the ability of the public to discern reality and make decisions becomes increasingly difficult. The information environment, according to NATO’s Allied Joint Doctrine on Information Operations, is “where humans and automated systems observe, orientate, decide and act upon information, and is therefore the principal environment of decision-making.” When governments and militaries make it their fundamental purpose to not simply deceive or manipulate the enemy, but to build and “maintain support” from the very populations that provide them with their funding and mandate, it becomes increasingly difficult for civilian leaders and the public at large to determine the actual reality of a conflict, effectively nullifying their democratic involvement in the prosecution of wars to which they must ultimately pledge their money, their reputations and even their lives. An example of an “effects matrix” used in planning and assessing psychological operations and other influence activities. 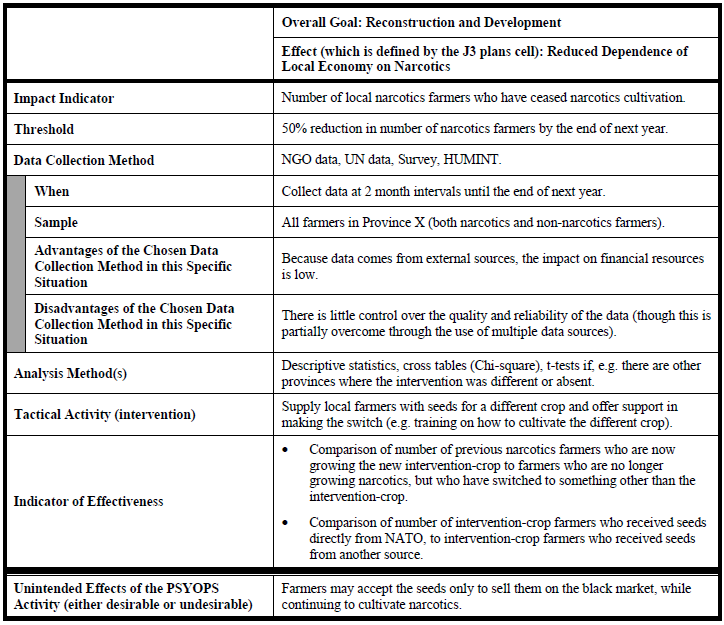 The table is presented in a restricted 2011 NATO research report “How to Improve Your Aim: Measuring the Effectiveness of Activities that Influence Attitudes and Behaviors”.